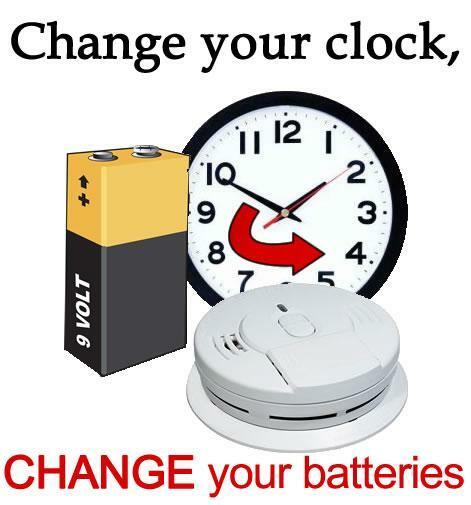 With Daylight Savings Time beginning this weekend on Sunday March 11th, the Cutchogue Fire Department along with the U.S. Fire Administration (USFA) encourages you to mark the occasion as a time to test your home smoke alarms and replace the batteries. Every day in the United States, needless home fire deaths occur. Working smoke alarms significantly increase your chance of surviving a deadly home fire. A properly installed and maintained smoke alarm is the only thing in your home that can alert you and your family to a fire 24 hours a day, seven days a week. Whether you're awake or asleep, a working smoke alarm is constantly on alert scanning the air for fire and smoke. •Dust or vacuum smoke alarms when you change the batteries. •Test alarms once a month using the test button. •Replace the entire alarm if it's more than 10 years old or doesn't work properly when tested. •Install smoke alarms on every level of your home, including the basement, and both inside and outside of sleeping areas. •For the best protection, equip your home with a combination of ionization and photoelectric smoke alarms or dual sensor alarms. •Interconnect all smoke alarms throughout your home so that when one sounds, they all sound. Interconnected alarms are available at most stores that sell smoke alarms. •Make sure everyone in your home understands the warning of the smoke alarm and knows how to respond. Finally, prepare and practice an escape plan so that you and your loved ones can get out of your home safely should there be a fire. Plan to meet in a place a safe distance from the fire and where first responders can easily see you.